A chair pad can make a dining or kitchen chair much more comfortable. The problem is that they can wear out from the constant friction. Additionally, your decorating tastes may change over time and those round chair pads you bought a few years back may not match your current style. Don't worry. 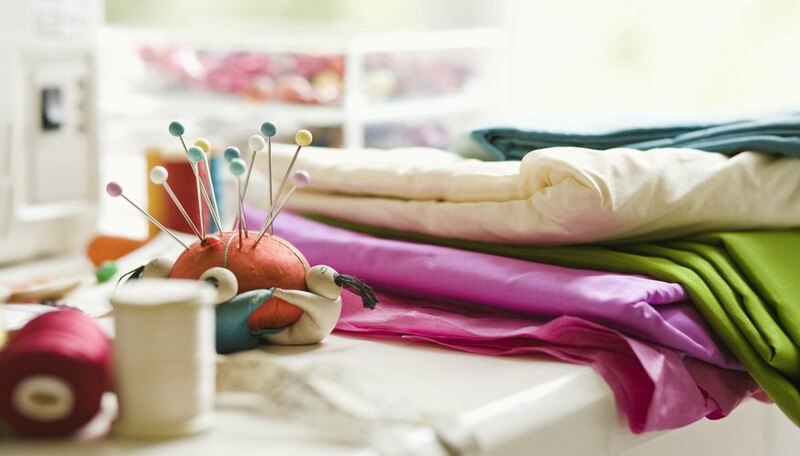 If you can sew, you can easily make new chair pads to replace the worn-out, outdated ones currently on display in your dining room or kitchen. Measure the width and depth of the seat of one of the chairs you are making the cushions for. You will want the diameter of your cushions to be 1 inch smaller than the smallest measurement. So if your chair measures 12-inches wide and 16-inches deep, your chair pad should have a diameter of 11 inches. Determine how high you want your cushions to be. If you want the cushions to be 1-inch high, add 1 inch to the diameter of your circle. Add 1 inch to the diameter for a seam allowance. To make a chair pad that is 11-inches across and 1-inch high, you will need a circle that is 13 inches in diameter. Draw the circle on the newspaper or poster board. Cut out the circle. Fold the fabric in half so that the raw edges come together. Make sure that the right sides are together and the wrong side is facing out. Place your circle on top of the folded fabric and pin in place. Cut out the circle. Repeat until you have enough fabric circle pairs to make the number of cushions you want. Sew the fabric circles together, leaving a half-inch seam allowance. Leave an opening about 3-inches wide, so that you can stuff the cushions. Very carefully, snip little triangles along the seam allowance, leaving about an inch between each cut out. Be very careful not to cut through your seam. If making more than one cushion, sew and snip the remaining circles. Turn the cushions so that the right side is out. Stuff the cushions with Poly-fil until they are full. Be sure to put enough in; a lumpy chair pad is no fun to sit on. Hand sew the opening closed.